Timing is important with the treatment of phobias and fears. The time must be right for the person and motivation needs to be strong. If the motivation is external eg from a partner or parent results may be poor or slow to appear. If motivation is an issue work with the motivational issues first before attempting to treat the phobia or fear. This will probably involve emphasising the positive benefits of making the change. The same is true of patients that are unwilling to confront that which they fear ie a refusal to undo avoidance and in cases where secondary gains are strong. Arguably the most rapid approach to phobia resolution is the combination of EMDR with graded and carefully selected multimedia resources. Typically this will involve a series of progressively more anxiety provoking background images. A hierarchy of stimuli should be negotiated prior to the desensitisation process. Only proceed to the next most anxiety provoking image when the current category of images has been desensitised. If the SUDS do not reduce with a specific image or category of images then drop down to the previous category. Never leave the process on a negative at the end of a session - again - drop down to the previous category. If blockages appear see the section within the EMDR training notes dealing with blockages. Blockages can also be overcome by integrating some of the techniques mentioned below. If blocking continues then examine the patients motivation and consider the role of secondary gain. It is strongly advantageous to teach some form of rapid relaxation technique that can be used to generate relaxation at any time during the desensitisation process. This can be integrated into the 'Safe Place' part of the EMDR phobia protocol. When presenting eg an image of that which is feared as the background image or tracking object consider using some form of relaxing background audio to assist in the process of collapsing negative anchors. An adaptation of the EMDR trauma protocol can be employed for use with phobias and fears. (See form provided with EMDR Pro). Simple phobia: Ask the patient to see themselves dealing calmly with the phobic stimulus. Whilst they do this, complete a set of eye movements. Process phobia: Ask the patient to close their eyes and run a mental videotape seeing themselves participating in every aspect of the originally feared process. If any anxiety or physical discomfort arises the patient is to open their eyes and that aspect reprocessed. The videotape is then returned to the beginning and restarted. If anxiety or physical discomfort are again reported at any point, then the patient is asked to open their eyes and that aspect reprocessed. Repeat this process until the patient can run through the entire experience without any disturbance. In all cases conclude with rehearsal of dealing with the simuli in the real world. If EMDR is contraindicated then consider using Vivo or Flooder. Flooder should be used gently to present specific narrow categories of images. Flooder can also be used at the end of an EMDR based process to ensure that a specific category of stimuli has been fully dealt with. Instant Audio can be used to play trigger sounds as the therapist is undertaking systematic desensitization / graded exposure therapy. The Fast Phobia technique (within Map Across Phobias) can be a rapid approach to the resolution of phobias and fears. It is especially useful for those that are relatively visual. In all cases explaining the process visually to the patient before using the technique tends to improve the end result. This is the role of the Fast Phobia Module within Map Across Phobias. Simply run the module and select an appropriate image - ideally something that does not generate substantial anxiety in the first instance. In due course transfer the process to the imagination. The Map Across Phobias technique can be used as a stand-alone approach, to overcome blockages when using another approach and can be integrated into a systematic desentitisation process when using graded images and the 'Advanced' option within vMA Phobias. For best results use the software to generate a visual model for the process within the patient's mind, once done if change has not taken place then move the process into the imagination with the patient's eyes closed. Formal desensitisation audio is available in the form of stereo files in which relaxation music is played on one side and the anxiety generating audio is gradually phased in on the other side. This type of audio can be effective when used by patient's when at home as part of an ongoing process of undoing avoidance. A more direct approach is viable for use in the therapy room and involves using graded audio files as part of an EMDR based systematic desensitisation process. Phobic patients tend to benefit from some form of regular, routine relaxation in the form of self-hypnosis or any other form of self-relaxation technique. This certainly tends to accelerate the treatment process. Images / audio / video is available in the shared media library provided with EMDR pro and the Toolkit. The main library is supplied on the installation CD (if requested) and a cut-down version of the library is available to EMDR Pro / Toolkit users within this website. Add-on mini-libraries are also available to cover specific issues such as flying phobias and height phobias. The Add-on Multimedia library significantly extends the range of images available and is available with the Therapist's Toolkit or as a standalone purchase for use with other Neuro Innovations products that are able to use external images. 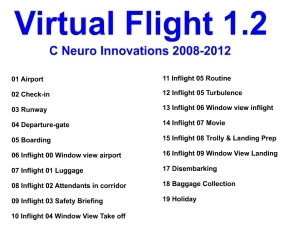 The Virtual Flight is a multimedia representation of an entire flight broken down into 18 sections. Virtual Flight is designed for use as part of a systematic desensitisation approach to the treatment of flying phobia via semi virtual reality software. 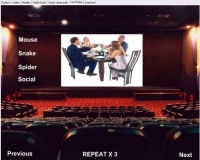 The software utilises high quality sounds and images, and is designed to be used in 'fullscreen' mode. To use Virtual Flight teach your patient a rapid relaxation technique and then gradually expose the person to sequential sections of the flight. Only proceed to the next sequential section when the SUDS for the current section have been reduced to under 3. The therapist should take an active role during the progressive exposure and should intervene as required to generate relaxation, to moderate self-talk, to provide surrogate positive self-talk and to generally be 'with' the person during the process. Limiting beliefs should be countered in advance via EMDR Pro and direct re-education. NB "Flying is totally safe" is an invalid belief that will vaporise when the next air-crash hits the news, "Flying is relatively safe" is slightly better, "I feel safe" is even better. A desensitisation utility consisting of graded desensitisation resources is available for the treatment of emetophobia. Usage is as per the Virtual Flight. The web itself is a vast library of resources in its own right of course.